Early morning trade in Asia saw crude oil futures slipping from last week's 3.5-year high, after the US said that the missile strikes against Syria were a 'one-time shot. 'With Syria having little oil production of its own, the main concern for the oil market is the threat to key supply routes out of the Middle East. In metals, COMEX gold futures fell in Sunday evening trade after the weekend attack. Gold futures were supported last week in part by the prospect of a military strike on Syria, as well as the escalating trade row between the US and China. Meanwhile, trading sources are assessing the impact of the restart of the Papua New Guinea LNG project last week. Operator ExxonMobil said deliveries are expected to resume soon, and traders said that the possibility of spot offerings from PNG LNG could add bearishness to the thinly traded spring market in Northeast Asia. Associate editor Weng Yi Le looks at these and other factors that could drive commodity markets this week. Early morning trade in Asia saw crude oil futures slipping from last week's 3.5-year high, after the US said that the missile strikes against Syria were a one-time shot. We’ll also look at the impact of the Middle East tension on gold, soaring aluminum prices, and the restart of the Papua New Guinea LNG project. First in oil, the US' declaration that its missile strikes against Syria were a one time shot, appeared to have dampened the risks to oil prices spiking when markets opened Monday. 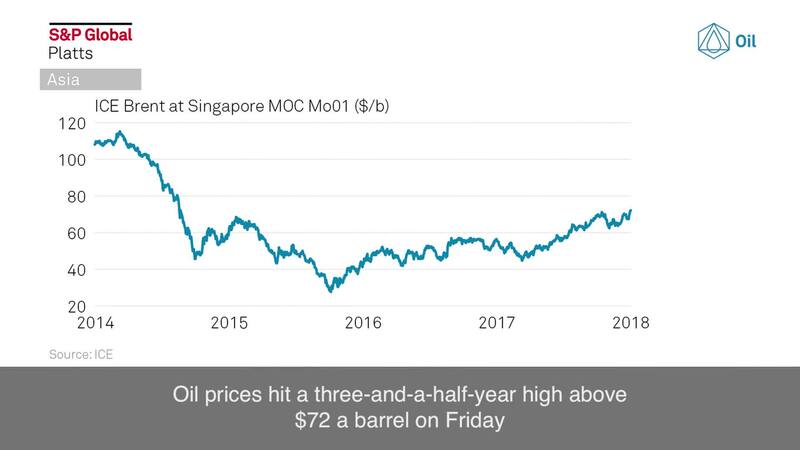 Oil prices hit a three-and-a-half-year high above 72 dollars a barrel on Friday when US President Donald Trump signaled his intention to attack. With Syria having little oil production of its own, the main concern for the oil market is the threat to key supply routes out of the Middle East. Will geopolitical tensions hamper trade flows to Asia? Meanwhile, aluminum prices neared 6-year highs last week, following US sanctions against Russia’s Rusal. Aluminum buyers are expected to shy away from Russian material, with the focus among buyers with immediate requirements ahead of the peak season being the next Indonesian sell tender for May loading due next week. Still in metals, met coal market participants are expecting more downward pressure on prices this week. Sellers are rushing to liquidate cargoes, before more cargoes emerge in May and June. In LNG, production has restarted at the Papua New Guinea LNG project, and operator ExxonMobil says deliveries are expected to resume soon. Trading sources are still assessing the impact of the restart, but noted that the possibility of spot offerings from PNG LNG could add bearishness to the thinly traded spring market in Northeast Asia. In petrochemicals, India and Southeast Asia will likely see higher methanol prices this week. International methanol supply will be tightening in the coming weeks due to April turnarounds in the Middle East. We’re talking about roughly four million metric tons per year of capacity going offline. In agriculture, Thai white sugar spot cash values have crashed from $21/mt premium in January to $2/mt discount last week. The market saw a record high production in Thailand and a strong May/August inverse spread. Thai refined sugar spot cash values will remain under pressure this week, with increased availability from India, Pakistan and CIS. Moreover, Thai whites are being replaced at destinations such as Taiwan by more competitive Pakistani whites. If you are in Kuala Lumpur on April 18, joins us for the S&P Global Platts Malaysia Commodity Market Insights Forum to get insights across various commodities. Remember to join our conversations on Twitter with #PlattsMM. Thanks for kicking off your Monday with us and have a great week ahead!